Original version certified in 1994 with CFE (General Electric & AlliedSignal) CFE738-1-1B turbofans. Re-engined variant certified in 2003 with Pratt & Whitney Canada PW308C turbofan engines. Marketing designation for a 2000EX with an enhanced avionics system and changes to pressurisation and oxygen systems, certified in 2004. 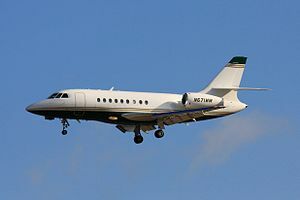 Undertook steep approach trials at London City Airport on 18 March 2010, becoming the first Dassault twin-jet to visit apart from the much older, diminutive Dassault Falcon 10. Updated model certified in 2007 and based on the 2000EX EASy with the same PW308C turbofans. Longer-range 2009 variant of the Falcon 2000EX EASy, with the addition of Aviation Partners Blended Winglets, giving it a range capability of 4,000 nautical miles (7,400 km). The same winglets are certified for the entire Falcon 2000 series as a retrofit kit. Variant which began testing in 2011 with short field characteristics. Landing distance has been reduced to 705 meters, opening up 50% more airports than other aircraft in this class. Compared to the $5 million more expensive LXS, the S range is shorter by 500 mi (800 km; 430 nmi) by restricting its fuel capacity to 14,600 lb (6,600 kg). It burns 2,350–2,400 lb (1,070–1,090 kg) of fuel in the first hour and 1,600–1,650 lb (730–750 kg) afterwards, and can take off in 4,325 ft (1,318 m) at sea level on a standard day. In May 2017, early 2013 models were valued $16-18 million and $26 million for late 2016 models while direct operating cost are $2,300-2,500/hr. Replacement for the long-range 2000LX to be offered in 2014, adding the short-runway features of the 2000S. Maritime Reconnaissance Aircraft version, based on Falcon 2000 LXS, purchased by Japan Coast Guard. Maritime Reconnaissance Aircraft (maritime patrol and surveillance aircraft) version proposed to French Naval Aviation to replace its naval Falcon 50 Surmar and Falcon 200 Gardian. It has been selected by the Japan Coast Guard. A Falcon 2000 slowing down using reverse thrust in Irkutsk Oblast, Russia. The aircraft is operated by private individuals, companies and executive charter operators. A number of companies also use the aircraft as part of fractional ownership programs. Dassault Industries delivered 4 Falcon 2000LXS to Aves Jet - Aves Multi Corp as part of its Civil Fleet Expansion Program. Republic of Korea Air Force 2 ELINT Falcon 2000s on order. Armée de l'Air 1 Falcon 2000S has been delivered to the ETEC, based at Villacoublay. ^ a b c d "Type Certificate Data Sheet F2000, F2000EX" (PDF). European Aviation Safety Agency. Archived from the original (PDF) on 29 May 2010. Retrieved 2009-09-18. ^ "Dassault presents the Falcon 2000S business jet for the first time in the Middle East." ^ "Dassault's Falcon 2000S Beats Performance Targets." ^ Fred George (24 May 2017). "Used Aircraft Report: Dassault Falcon 2000S". Aviation Week Network. ^ "Falcon Combines 2000S With 2000LX For New LXS." ^ "Japan Coast Guard Selects Dassault Aviation's Falcon 2000 Maritime Surveillance Aircraft". 22 April 2015. Retrieved 22 April 2015. ^ Anderson, Guy. "South Korea boosts ISR capabilities with Dassault Falcons". IHS Jane's. 29 December 2011. Retrieved 1 January 2012. Wikimedia Commons has media related to Dassault Falcon 2000. "Dassault Falcon 2000LX" (PDF). Business & Commercial Aviation. September 2009. Archived from the original (PDF) on 13 July 2016. "Class Warfare: Falcon 2000S" (PDF). Business & Commercial Aviation. July 2011. "Dassault Falcon 2000LX" (PDF). Business & Commercial Aviation. March 2012. This page was last edited on 14 April 2019, at 03:11 (UTC).